mommy's reviews: Lunch Packing Made Easy With Rubbermaid's LunchBlox Sandwich Kit! How soon do I forget the days when I used to pack a lunch for work. I went through these phases when I would just throw a frozen dinner into a bag and haul that to work. Or, I would make a super healthy lunch complete with fresh fruits and veggies and a salad. I am not sure why I went through these phases but I always remember thinking how unorganized my lunches looked. Not that anyone cared or was paying attention, but it would have been nice to have had everything organized and neatly in place so lunch time was quicker and more efficient. When I hear or see the word "Rubbermaid", I think of quality and I think of practicality. I own many Rubbermaid products and use them daily. This was why I was so excited to review this brand new product from them...it's another great item for my home and family! So, for this review I was sent a LunchBlox Sandwich Kit to check out and I am really happy with it! 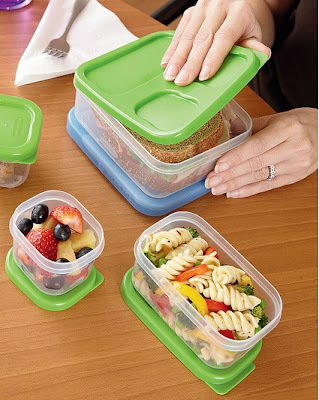 This is an all-in-one lunch box kit that will eliminate Ziploc and sandwich bags. As you can see, all the containers stack neatly on top of each other and nest really nicely. I love how they are see through so you can see what is in your containers as well. You can also stack them with the largest box on the top if you prefer...they all snap together to stay in place. Also, this cool kit comes with Blue Ice and you containers can attach directly to that. This assures that your lunch will be nice and cold if you are unable to have access to a refrigerator. I had some jobs that took me outdoors and this would have been a great feature to have when packing my lunches on hot days. I am also really happy that these containers are proportioned well so you don't over-pack your food. Sometimes it is hard to determine your portion sizes and so this prevents overeating. The LunchBlox Sandwich Kit retails for $12.99 and is a really GREAT solution for practical packing. The LunchBlox Sandwich Kit is currently available for purchase at Rubbermaid.com, Target, Kmart, Kroger, Safeway, Bi-Lo, Winn-Dixie, HEB, other grocery stores and select Wal-Mart stores If you are looking for other news and information from Rubbermaid, check them out on Facebook! Be sure to also follow them on Twitter. Disclaimer: I received no monetary compensation for this post. I did receive free Rubbermaid products for review purposes. All quotes and stock photos are from the Rubbermaid website and email. All thoughts and opinions are 100% mine.